In a large non-aluminum pot over medium-high heat, add butter and oil. Once butter has melted, add shallots and cook for 5 minutes, being careful not to burn them. Add garlic and cook for 3 minutes. Add wine, clam juice and salt and pepper to taste and bring to a boil. Add mussels, gently stir and cover the pot. Reduce heat to medium and cook for 8 minutes, checking pot occasionally to make sure mussels don’t burn on the bottom, or until mussels open; discard any that did not. 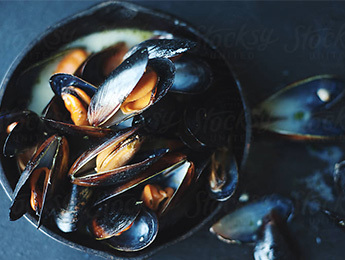 Pour mussels and liquid in a large serving bowl, garnish with parsley if desired and serve immediately.